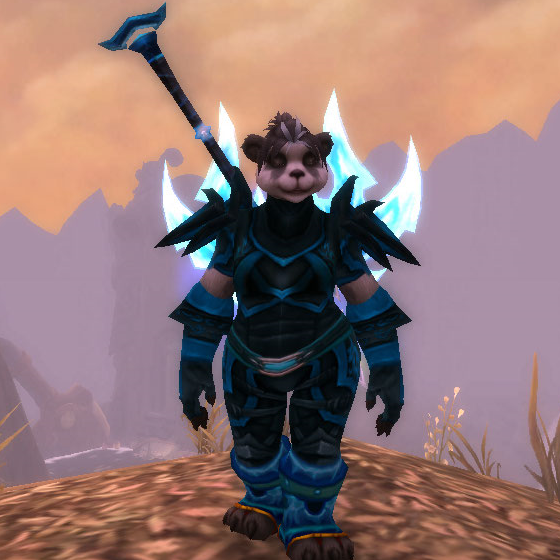 I got the Legendary cloak on my main, the Mage, a loooong time ago, a couple of months after MoP hit. “Great,” I thought, “No more LFR ever. Thanks very much!”. So… WHAT THE HELL POSSESSED ME to do it a second time?! The stupid LFR groups, the hour queue for each damn group, the redundant Nalak quest which takes ages to find a group for, the rep grind… blergh. Looking at her, it was worth every pain-staking minute! 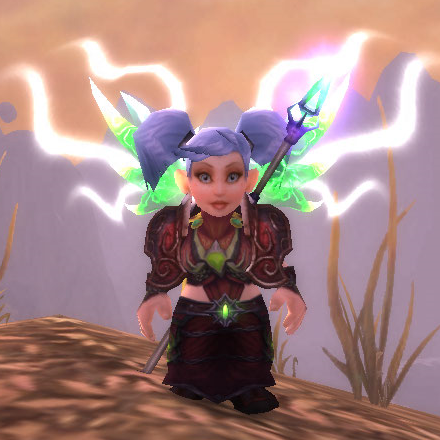 On another note, I’m not sure I like this mog (which is the only one that remotely matches the cloak proc), so any suggestions are welcome! I thought I’d stare down this guy, in Valley of the Four Winds, by the Golden Pagoda. I would SO win in an arm wrestle. 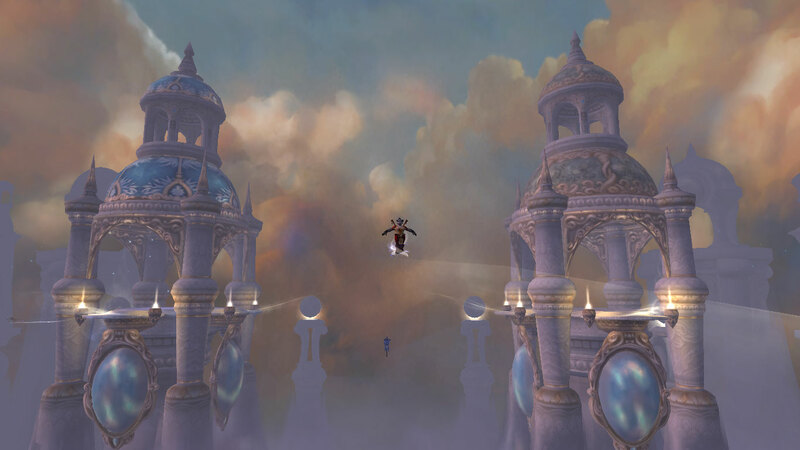 Every week, some people on twitter do a Friday ‘Fun Run’ to different raids as a group, and this week, we went to Throne of the Four Winds. This week’s picture is taken from there. It really is beautiful! So, I like to find places to meditate which make me smile. 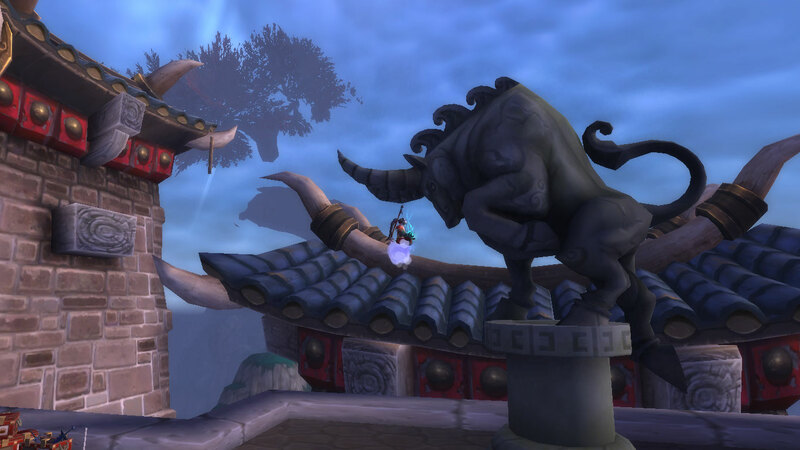 This week, I faced down a bull at Niuzao Temple… he’s kind of cute, right? Re-roll, Day 29: DING 90! We have loved every minute of this experience levelling together. 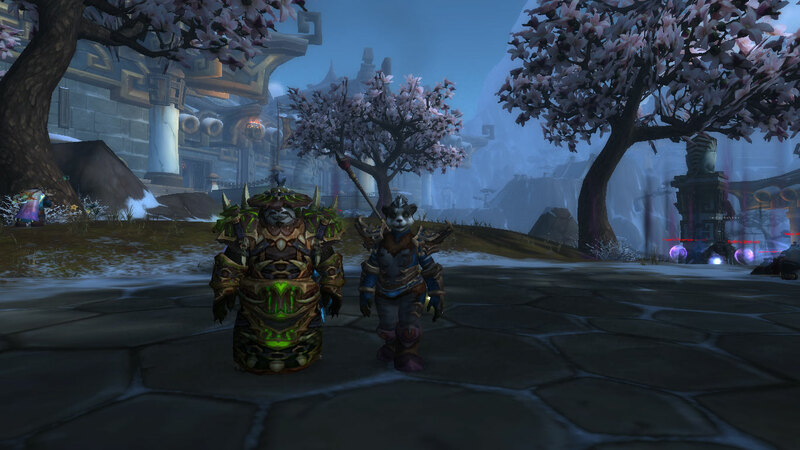 It has been enlightening, for the first time questing and enjoying the Warcraft experience right from the start together – seeing zones and quests which we perhaps would not normally do. 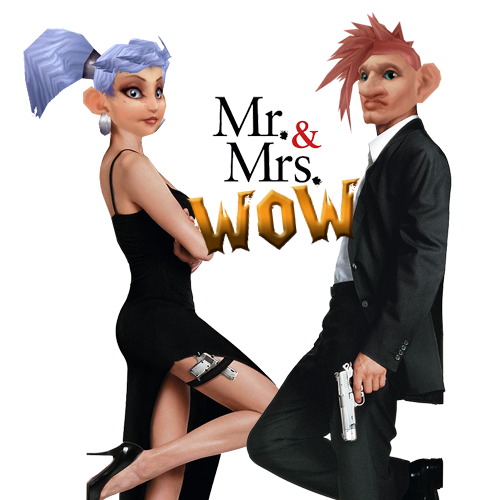 It has involved a lot of patience and compromise, but ultimately, a lot of fun! iLevel: We didn’t note it down. Time played so far: Nor this, sorry! Favourite moments: I felt really good that we 2 manned a rare in Kun-Lai – Havak. We both have self heals and as long as you move out the crap it’s do-able. Least Favourite moments: none really, enjoying it! Instances: none, but we did do Sha!! Favourite moments: barrel rolling the mobs and setting them on fire was good. Smashing things with the big yeti too – you do the quest then you get it as a daily so 150k xp for the actual quest then 178k xp for a really easy daily quest! Least favourite moments: we were doing a pug dungeon and we weren’t paying attention to chat (does anyone??). We were at the bit in Shado Pan Monestary where you need to defeat the initiates and we didn’t realise someone was yelling STACK multiple times. By the time we did realise, he had called us “fag pandas”… totally unacceptable for several reasons I promised Mr B not to get on my soap box about. Once again, the general foul manners of some members really put a downer on our play time. We left immediately and made a cuppa. 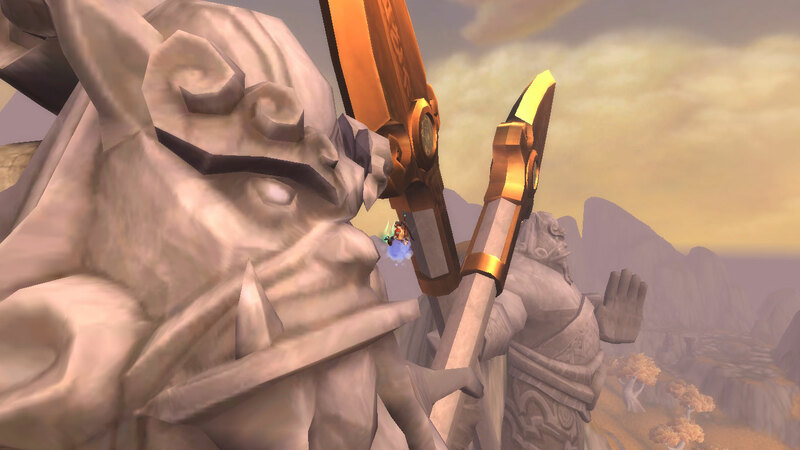 Instances: Shado Pan Monestary (we queued again with a friend). Level and % of level: 82% through 89!!! Least favourite moments: finding the Violet Citron and Volatile Orbs for the quest. Small area and lots levelling so lots ninja’ing as you’re killing nearby mobs. I finally have a matching set of gear but the belt makes it look stupid. Hmph. 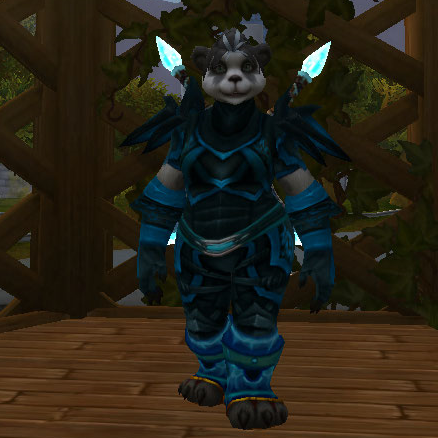 Some horrid tank who tanked Frost Lord ninja’d my 480 cloak. Was NOT happy! 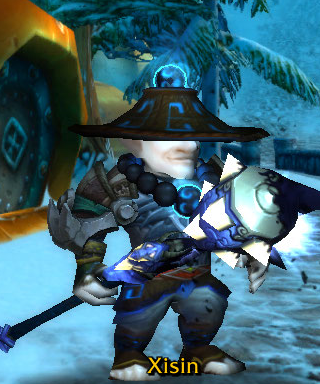 We also upgraded the pieces of gear we had left from the gear vendor at Longying Outpost who sells 408 gear. It’s quite expensive at 33g per piece, but worth it as these mobs hit quite hard!